Kate Jacoby and Rich Landau of Philadelphia’s Vedge and DC’s Fancy Radish. For the plant-based power couple behind H Street’s Fancy Radish, the holidays are another occasion to give vegetables their due. 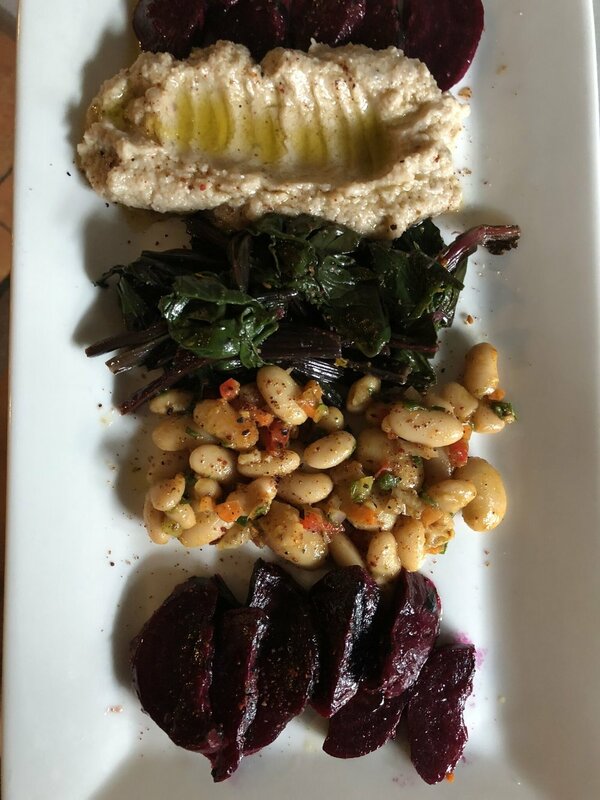 As if Kate Jacoby and Rich Landau of Philadelphia’s Vedge, V Street and Wiz Kid—lauded among the country’s best vegan restaurants—haven’t done enough for the food pyramid’s humblest roots, they can’t help but pay tribute through vividly seasonal dishes this time of year. The pair has spent the year demonstrating in the District what they’ve already shown The City of Brotherly Love: how to make the most of the produce aisle. And it starts with dispelling the myth that every vegetable, particularly at the holiday table, needs to be basted with butter and cream. This roasted acorn squash with black lentils is an excellent dish for guests. Get the recipe here. Landau started cooking vegetable-centric meals at the bar of a health food store in the Philadelphia suburbs back in 1994, when rejecting animal products to eat vegan was still more of a punchline than a trendy lifestyle. Jacoby joined him there in 2001, and caught a vision for sharing his approach to food more broadly. The pair brought their upscale vegetable-centric dining to the District with the opening of Fancy Radish in March. Phone numbers with a 202 area code had been filling their reservations books at Vedge in Philly, and regular patrons had taken to begging: “We need you down here” in DC, they said. Jacoby, who went to Georgetown University, and Landau, who has family in the area, said the city has been a perfect fit, welcoming them at a time when vegetables are shining on more and more menus around town. At home, the couple and their son, Rio, who turns 11 this Thanksgiving, keep vegetables from getting sidelined at the holiday table, even if it means doing things a bit differently. Neither of them comes from a long line of vegans. They understand firsthand the conflicts that can surround the mixed traditions and dietary restrictions of a large family meal. But Jacoby and Landau tend to skirt most of those tensions by hosting the meals (something that’s expected when you run a growing fleet of restaurants) and upping the vegetable ante until even the most devoted carnivores don’t miss the meat. One year, a gigantic roast squash stuffed with a vibrant cabbage slaw starred as the centerpiece. Another, grilled tofu rubbed with dried sage and drizzled with black pepper gravy left guests with plenty to carve and cut. Landau says the goal isn’t so much to mimic meat as it is to present a picture of abundance on the table. Carrot cake can bean attractive and tasty vegan dessert, and can be made ahead. For those still squeamish about the idea of a vegan holiday—what, no butter?—Landau points to a killer Christmas party the family hosts one Sunday in December almost every year. Jacoby says she always wanted a big family gathering like the ones her grandmother remembered and this event, which draws 50 to 60 friends and family members, helps her scratch that itch. Christmas music from the 1940s plays in the background, alcohol flows—and a spread of food that goes well beyond vegetable crudités leaves guests satisfied. Brilliantly colored vegetable dishes fan out on the table to replace “all the brown, beige and tan” typical of holiday feasts, Jacoby says. To drive the point home one year, the couple’s Christmas party featured a carving station with white bread, horseradish and hunks of seasoned seitan for slicing. (Made from wheat gluten, seitan can closely mimic the look and flavor of roast meat). Trumpet mushroom fazzoletti makes for a hearty winter dish. That said, Landau and Jacoby don’t insist that anyone else adopt their dietary preferences—though they do try to make them more tempting to the masses. They both cheered the way veganism, which could come off as cult-like in its earlier days, has opened the door to those dabbling in meatless meals, whether once a week or just once in a while. That means there’s never been a better time to be the one bringing a vegetable dish to the holiday table. Greenease (available on both the App Store and Google Play) is a new app that aims to make eating "green" (meaning local, sustainable, and diet-specific) easier not just for consumers, but for farmers and chefs as well. EdibleDC is partnering with Greenease to support the use of local food sources in the DC region, which benefits both local farmers by increasing demand as well as customers by encouraging fresher dining options. In the summer of 2018, Greenease is launching the pilot of the Greenease Business platform where chefs can log in to update their farms, search for farm-fresh food, and push out specials on the app. Farms can soon log in to verify who's buying from them and add their inventory to the database. The app is also useful for those seeking restaurants with diet-specific options, such as vegetarian, vegan, and gluten-free menu items. Greenease will also tell users whether restaurants use sustainable seafood, grass-fed beef, organic ingredients, and free-range and drug-free meats in their menus. Greenease is currently up and running in the District as well as in more than twenty other cities, such as New York, Chicago, and Los Angeles. To access this exclusive offer, simply download the Greenease app and select the "Dino's Grotto Four-Course Dinner for Two" deal. Scroll down to view what's included in the deal, then hit "Purchase" to access it for yourself and a special someone. Here are some of the delicious menu items that are available with our deal! The full dinner menu for Dino's Grotto can be found here. Negroni and antipasto with all local ingredients @ Dino's Grotto.